LONDON: England great Alastair Cook will retire from international cricket after the end of the ongoing series with India, the opening batsman announced Monday. The 33-year-old Essex left-hander is England’s all-time leading Test run-scorer with 12,254 at 44.88 including 32 hundreds while his run of 159 consecutive Test appearances is a world record. But the former England captain has struggled for runs recently and averages a meagre 18.92 from nine Tests this year. “After much thought and deliberation over the last few months I have decided to announce my retirement from international cricket at the end of this Test series against India,” said Cook in an England and Wales Cricket Board statement. 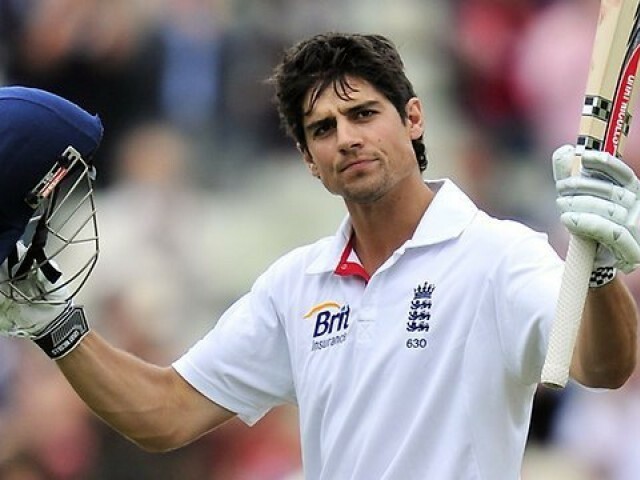 Cook was satisfied with what he achieved over the course of his career but he no longer had anything to offer for England cricket. “Although it is a sad day, I can do so with a big smile on my face knowing I have given everything and there is nothing left in the tank. I have achieved more than I could have ever imagined and feel very privileged to have played for such a long time alongside some of the greats of the English game. The thought of not sharing the dressing room, again, with some of my teammates was the hardest part of my decision, but I know the timing is right,” he said. The former England captain also hoped that cricket in the country would go from strength to strength in the future. “I have loved cricket my whole life from playing in the garden as a child and will never underestimate how special it is to pull on an England shirt. So I know it is the right time to give the next generation of young cricketers their turn to entertain us and feel the immense pride that comes with representing your country. I wish the England team every success in the future, and I will be watching with great excitement,” he said.